The Dutch galiots were flat-bottomed ships with a rounded bow and aft, especially useful in shallow waters. Their development started in the 17th century. They were used mainly as merchant ships. There are more photos, several views of the entire ship model taken from all directions and several closer views of hull, deck and rigging. If you click on a photo you will get that photo in high resolution. This model of a Dutch galiot is a beautiful, elegant piece of work. It is 1 : 40 scale. Length is 106 cm, width 41 cm, height 84 cm. The ship model stand is provided by two small wedge-shaped pieces of wood beneath the hull, close to the keel. The wedges are fixed to the hull by double-sided adhesive tape. 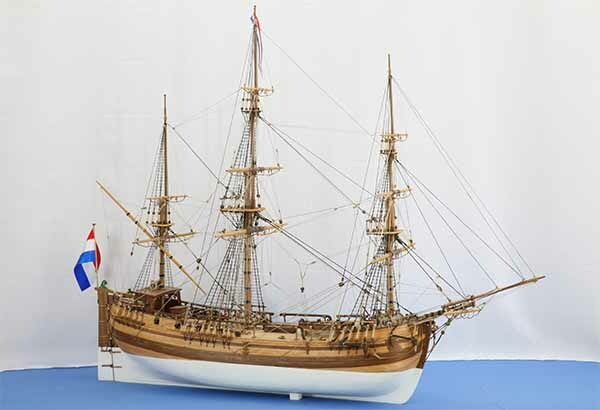 The model was made according to the drawing of a three-masted Dutch galiot by Chapman in his 1768 book (see my linklist) "Architectura Navalis Mercatoria", plate No. LIV (see below).